Today we did something that seems pretty crazy. It would have seemed unthinkable not all that long ago. We signed an agreement to trade our Kia Carens 2.0CRDi for a slightly younger Fiat Panda 1.1 eco somthingorother. Why? Because when it comes down to it, I couldn’t care less about cars. Unlike riding, driving’s fine, but not a pleasure. Taking my children on holiday is a pleasure. Driving is just necessary and expensive. However, the Panda will be a grand a year less than the Carens yet will do 95% of the work just as well. I know my friends will laugh. They already have. But honestly, I just don’t care about cars. Here goes (I apologise for repeating some things I mentioned in a previous post). The Honda CB100n. My first bike. Bought for a song, simple and characterful. It had things like contact breakers and tappets that needed adjusting with a spanner. I’d use it as well. Actually I’d probably buy two or three of them and a Haynes manual as it would be the only bike I would work on if I had plenty of money. Other than that I’d be paying Alan to come to my garage every week to adjust chains, pull in for servicing and so on. The CB100N would be for me to satisfy my urge to get tool out and mess things up. The Kawasaki GT550 was my first big bike and I loved it. That would need to be the later model and in red. I imagine I’d want to ride that as well. Being a shaft drive, Alan probably wouldn’t need to do much with it between services though as it would only go out on clean dry roads. The BMW K75RT. In memory of the URide trip, this would need to be 1992 with a missing side panel and non functioning speedometer. Actually, I’d probably just ask Dan if I could buy his, get in covered in dust from the West Virginia dirt roads (assuming he has now washed it) then have it sealed in box and shipped over. Warts and all that one. Ride it? Probably. Alan would be splitting it ever few thousand miles to check the clutch splines though. I’ve always wanted a Classic British bike and as a fan of little bikes it would have to be a BSA Bantam. Mine would be one of the 175cc bikes and the older the better really. Sure I’d ride it but it would probably do more miles on a trailer. It would spend most of it’s life in the living room next to the other bike under this heading, looking beautiful. Outings would be to steam rallies alongside the CB100N. Only one manufacturer makes an engine which is a thing of beauty. I would have to have a naked Ducati of some sort. It wouldn’t be for riding. In fact, I may even leave one side pristine and then cut up the other side to expose some of it’s inner beauty. Exactly which one I’m open to suggestions on. First up, Mine. I’m not going to get rid of my Wee! It would just get all those suspension upgrades I’m always wishing I could afford. I might put a full luggage system on as well. This would be the most used bike right through all four seasons. I’d put pure road touring tyres on it as well (in fact, that’s probably gonna happen anyway). I’d like a CRF250. The rooftop chase in Skyfall was amazing and I really would like to have a go at off-roading one day. I’ve also spent a lot of my riding life on 250s so it would be wrong not to have one. This would probably get used just as a local run about as well as for light green-laning. Not so much with the roof to chases though. I would like a big tourer. I loved Dan’s RT but I like the idea of a modern boxer. We would want something super comfortable for good long trips two up. The R1200RT would make plenty of sense. I would probably use it two or three times a year. However, all my mates who ride would know it was available to them for when they want to go two up touring. If we won today, Ang would probably want to keep her YBR125. Just maybe she would consider swapping it for a CBR125. Either way, we wouldn’t be without a bike suited to a pair of L plates. When Ang does get her full licence, she fancies a Triumph Street Triple. Actually, we can’t get rid of the YBR. We’ve already promised Mummy's red bike to Beth. The final bike is a request from Beth. She wants a side car outfit so she can go with me on rideouts. Having followed redlegsrides as he explores snowy mountain roads aboard his Ural Patrol rig, I’m slightly taken with the idea. If it means I could share the pleasures of riding with my children while they are still young, I’d have one in a heart beat. While the Ural rigs are kin of cool, thanks to Wallace and Gromit, ours would probably be an Enfield Bullet with Watsonian Squire side car. Of course, there would be a few other little bikes for the kids. A reasonable selection of electric bikes, crossers and mini-motos would be available for fun and frolics with friends. With a garage like this, heated, clean, brightly lit with a good size screen playing all my favourite videos on a loop, hot tea and comfy seats, it would be a great place to just sit and be. When friends come round, they could choose one of mine or ride their own. It’s good to share. With ten of the above bikes available for road use, there'd be plenty to choose from. I’m not sure Kev would be tempted off his trusty CBR600F with a CB100N or even a shiny new CRF250 but you never know. The choice would be there. And, if it’s too wet get them to ride, we could just chill amongst the bikes, drink brews, natter and be. So now I’ve got my wish list sorted out, I just need to wait for my numbers to come up, preferably after a few weeks of roll-over. Don’t worry though. I’m not holding my breath. Besides, I’m already a lucky man. Two of those bikes are in my garage and right now they are both running beautifully. Another is in my brother’s on the other side of the Atlantic, available if we want it. The point is, there's no car in my dream garage. There would be some car. Probably a small some car for getting about and a bigger some car for getting more/bigger things about. The bigger some car would be for towing bikes mainly. They can live on the drive or stuck out on the road for all I care. Car just move stuff and people. Bikes move me. Bring on the Panda. Not this one exactly but it looks a lot like it. Just some car to do the job. No track bike? I think I'd have to include a 500 Kawasaki or one of those two-stroke 350's just to get my ya-yas out on. :-) Never been on a track in my life. Nor have I considered it really. Probably I should have one for my mates who don't get all excited when they see the other bikes. I would need to let them choose one cause I wouldn't know where to start. Great post. Good to have dreams mate. I hope yours come true. just be prepared for an Aussie to come over to borrow one of your bike to go for a ride with you. Maybe it's about the indivudal character and temperament, at least it seems to me, that motorcycles once had. Older riders (like ourselves!) who have seen a few bikes come and go in our time, tend to understand this better. Read my comment on http://thekneeslider.com, for example, on the subject of used bikes. Younger riders, accustomed only to riding identical-looking, plastic, multi-coloured blobs by different manufacturers, may detect no difference or not even be aware of motorbike character and individuality. My 1970's Norton 750 Commando had such a totally different character compared to my later 'slingshot' Suzuki GSX750. You even get used to how they handle differently and you adjust your riding accordingly. My Suzuki Inazuma GW250 handles very well too, surprisingly for a smallish bike, maybe because of its 182kg weight. I have no complaints about the Inazuma at all. It does me well and it's certainly fast enough. The acceleration it has is what continues to impress me and also surprises quite a few bikers on 500's at the lights! I suppose you have to be nifty with its 6 gears but with the programmable Rev Indicator LED's it makes it easy and fast to change up. 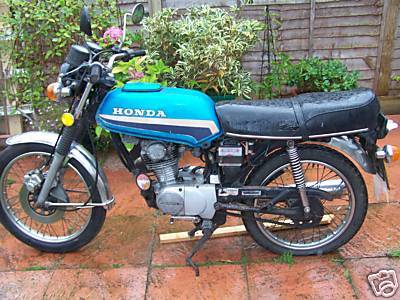 I also, for the same as reason as you, fancied a Honda CRF250! Great bit of stunt-riding too I thought!